As a seasoned teacher, I know that I am helping set the foundation for children, not just for this year or kindergarten, but for a lifetime. I am teaching the whole child! Our class is not centered around my direct instruction. Instead, it involves interactions with other children, the ability to process information, decision-making skills without my intervention, and more. When a child steps foot into my classroom, it isn’t ABC’s and 123’s that we focus on. Shapes aren’t the main task, and colors are not the main priority. Those things will come, I assure you. They always do. They just don’t trump the many other necessary aspects of learning that preschoolers need to do. 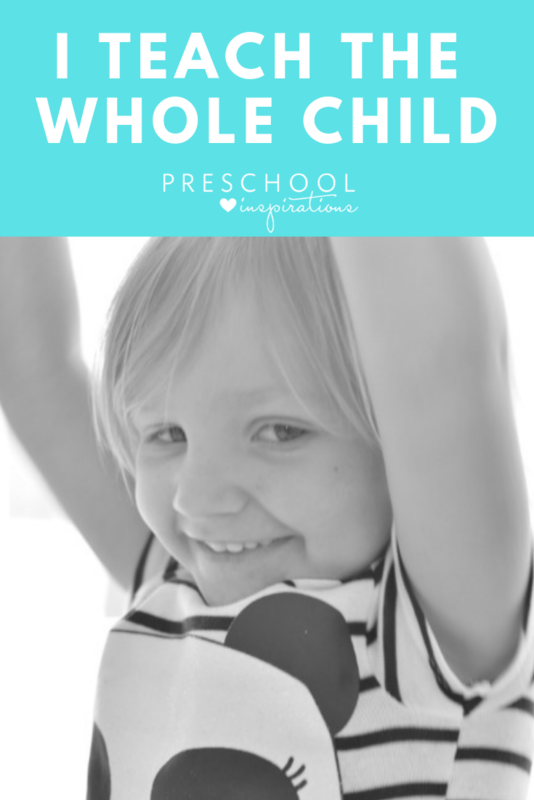 When I teach preschoolers, I teach the whole child, not just their brain. I teach them to live, to love, and to grow. I encourage children to be confident so that they can speak up when they need something. I teach children to pass along a toy once they are finished so they can practice generosity. 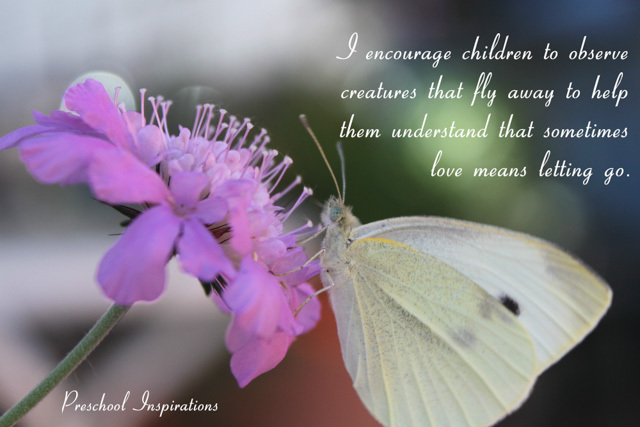 I encourage children to observe creatures that fly away to help them understand that sometimes love means letting go. I encourage children to care so that they can offer a hug to a hurting friend. I offer children choices to show them that what they are interested in matters. 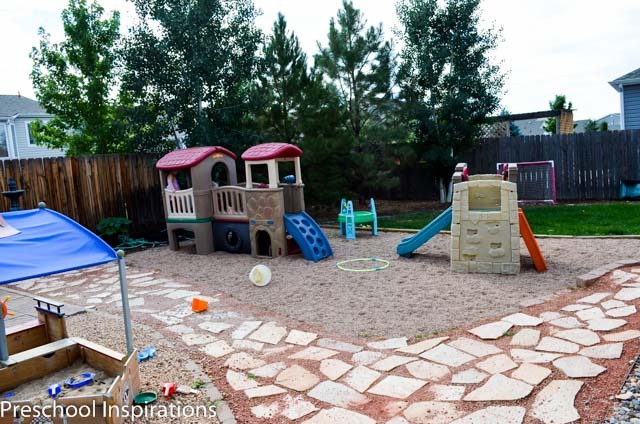 I provide children with open-ended activities so that they can create, imagine, explore, and discover. 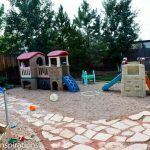 I provide children with items that can spill or break or so they can practice life skills. 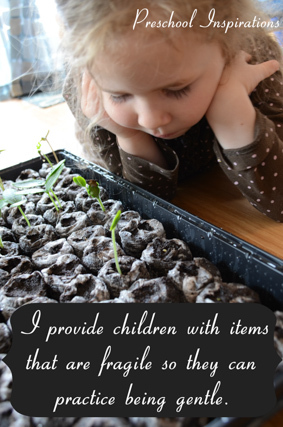 I provide children with items that are fragile so that they can practice being gentle. I provide children with time when they disagree with one another so that they have a chance to work it out. I provide children with unhurried moments so that they develop persistence in whatever they are doing. I allow children to be angry, frustrated, or upset because it happens to even the best of us. I teach children that mistakes are allowed because that is how we grow. I encourage children to hope because sometimes we need it to see the other side of the rainbow. To read more about my teaching techniques, you can see my philosophy on learning through play. Take a tour of my classroom and the environment that I set up. Do we sound like we could be teaching BFFs? 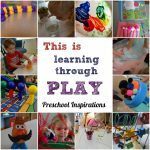 I’d love to share some of my favorite tips for Circle Time. 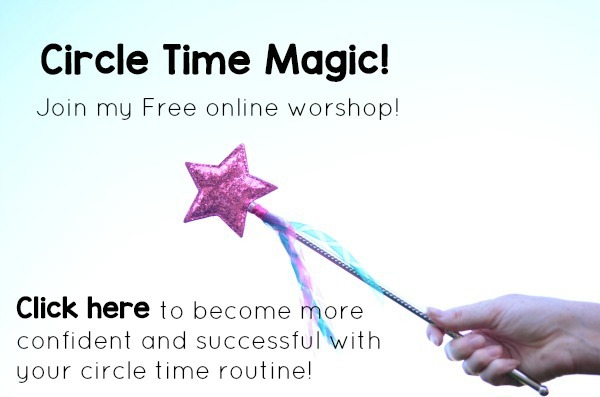 You can get my free circle time series delivered right to your inbox! I agree with your philosophy whole-heartedly. I have been retired from teaching about a year, and how I wish my administrators in the public school system could just understand that academics is not always the first priority. Some of my students came to school with so much “baggage,” they just needed to experience a kind, caring environment where they could get hugs and attention. I totally get what you are saying. I also hope that one day more administrators see the whole child, Linda! Our children deserve it! Thank you for all you do and have done for young children :). Just one of the many reasons why you are amazing! Hi Katie, I just came across your site on facebook and I’ve had a quick read of your latest post. I am also an early childhood teacher and I’m based in Auckland NZ. I completely relate to the philosophy of teaching the whole child. We are lucky enough in NZ to have a wonderful early childhood curriculum Te whaariki which encompasses the importance of relationships and emotional intelligence as well as the unique bi-cultural aspects of Aotearoa NZ. I have just recently set up my own website please feel free to take a look and comment! Thank you for taking the time to comment, Mo! Your blog is lovely with wonderful ideas! Your curriculum sounds incredible. I can’t wait to research it more :).